My sincere apologies for a long delay in posting the battle reports. Here is the one from the last game of the Valley of Kings 1 tournament. 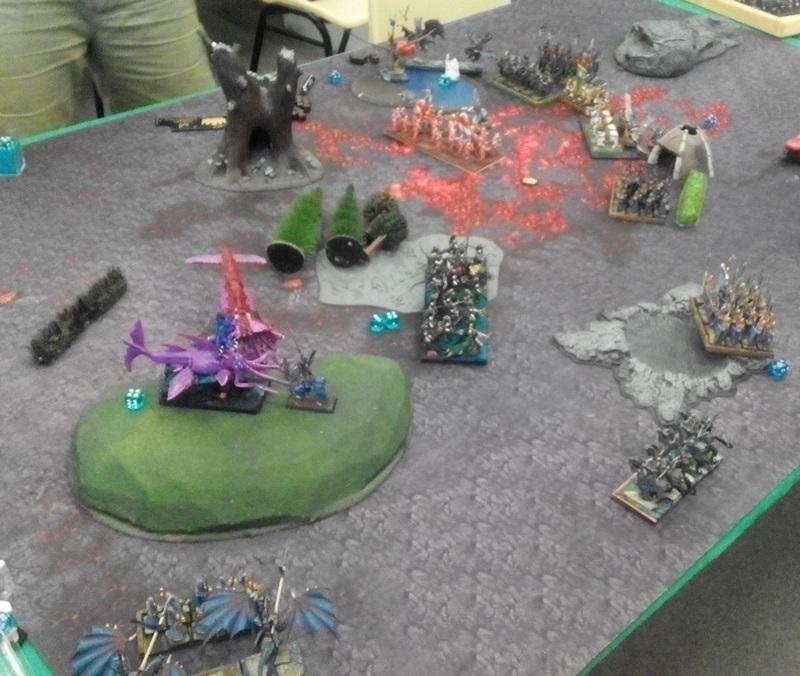 This time I had a pleasure to play against another veteran of the Canberran KoW community and a very creative Trident Realm player - Tas. It would also be a rematch as we had one encounter already so I was really looking forward to seeing how the game would develop this time. Even more so that we used most recent CoK 2017 suggestions and some of the units in the army of Trident Realms got a bit of a boost too. 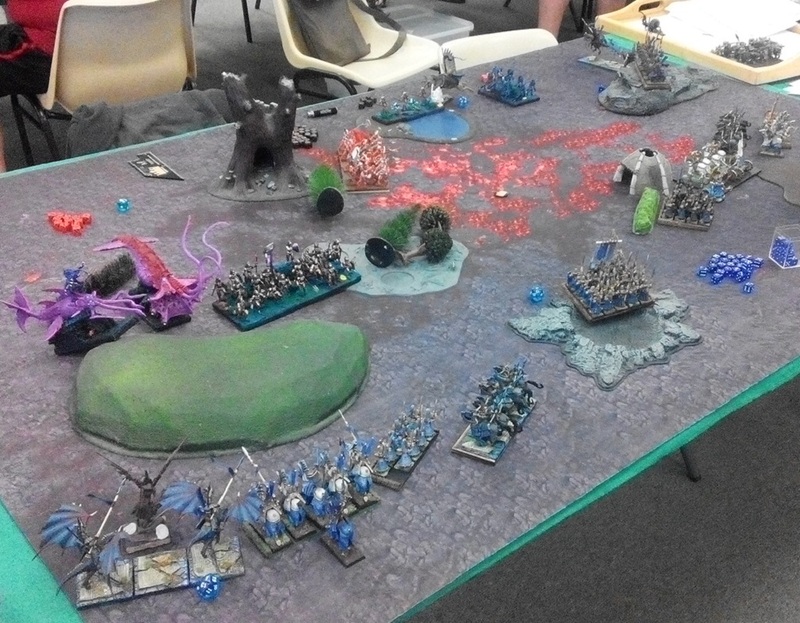 The new army was a mix of the units I have already played against and those I faced for the first time so let's have a look at them all again. 40 Naiad Ensnarers - a great looking unit, especially on a unit base and Tas did great in showcasing it! Naiads are great but they have to be used carefully as with Defense 3+ they may take too much damage before they can regenerate that. However, this time Tas gave them a nasty item - the Crystal, that seems to be designed to combat MSU! 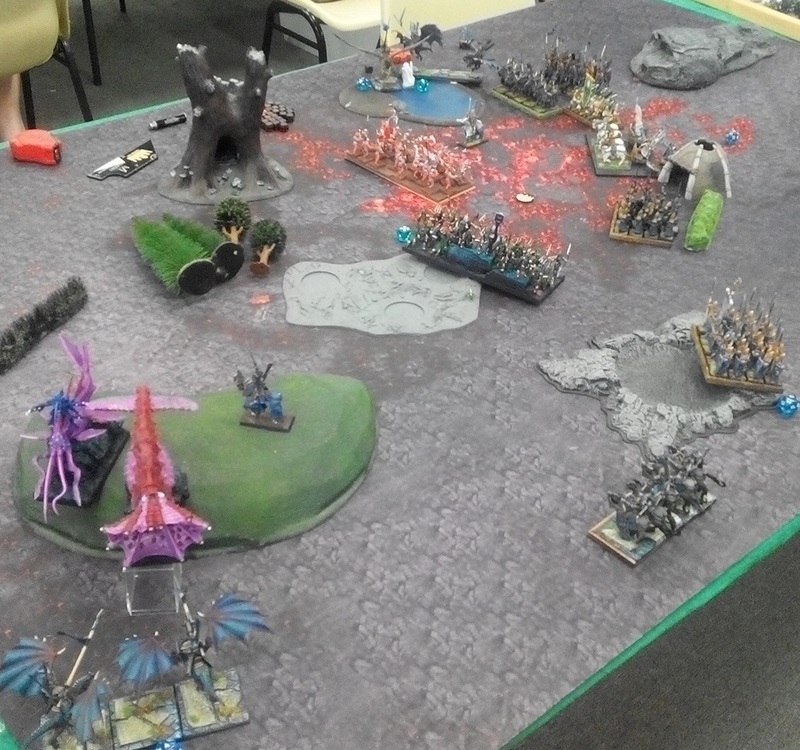 :) My plan was to try and still inflict the damage at a distance so that I could potentially send one unit to finish the job and not to blow half of my army in the process. Of course that is easier said than done but I was very curious to see how Tas is going to use his mobile tactical nuke of a unit! 40 Placoderms - the most prominent of the new additions, Pacoderms seem like an ultimate anvil type of a unit. Defense 6+ on its own is simply great, then they also have Phalanx which makes them even better. On top of that they also got Ensnare with the most recent update which makes them extremely hard to shift if attacking from the front. They came with Brew of Haste upgrade in order to make them a bit faster as their speed is not that great and can be potentially exploited by the faster enemy. I assumed that the key to defeat them is still a big, combined charge but attacking from the flanks is even more crucial than ever. Simply because neither Phalanx nor Ensnare work from these directions. But the difficulty would lie in isolating the unit and keeping enough of my own for that big charge. 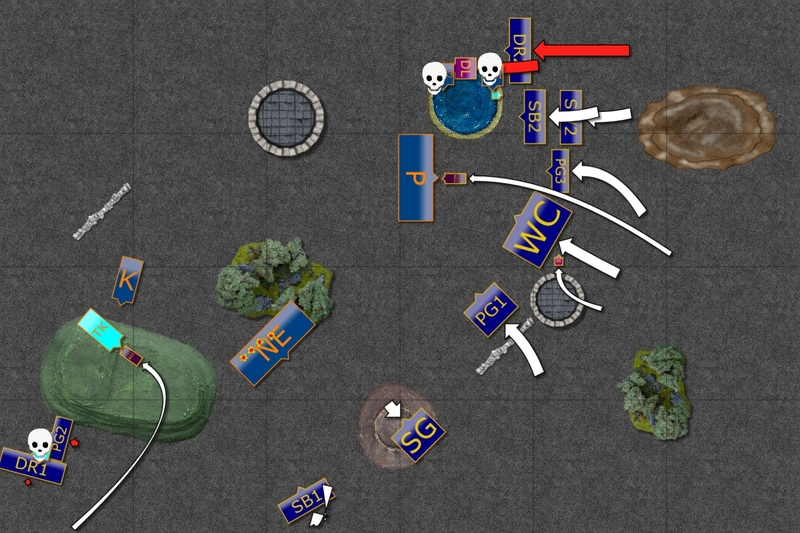 6 Depth Horrors - Horrors are old friends :) As fast as my infantry and very dangerous in melee, I have already learned the best way for me to deal with them is to hit fast and hit hard so that they are gone before they can fight back. Even more so when they sport Blessings of the Gods upgrade, to make the most out of their attacks. 2 x 10 Nokken - another new addition but the one that would serve a completely different role. They have some shooting abilities but breath attacks, although very flexible, are also short ranged. They have Vanguard so I expected they may jump into some nice, defensive terrain and tempt early charges that may not be that successful due to combination of being hindered and Ensnare special rule. On the other hand, catch them in the open and they will be very fragile. 3 x Leviathan's Bane - quite a powerful battery of war engines. Piercing (4) looks scary in particular. And with three of them at the same time they would have a good chance to keep hitting the targets regularly. Attacking them from the front, especially when entrenched in the defensive positions, may not be easy, even with tripled attacks. Kraken - another well known monster in the army. Great model and very dangerous element. I was curious to see what role would it play in this force. Thuul Mythican - new hero which I have not play against before. Looks to me as a similar one to a wizard that not only supports nearby troops but also has reasonable amount of attacks. Very versatile and flexible hero. Placoderm Defender - flying hero with 6 attacks, who also gave up some defense to gain Crushing Strength, he is obviously here to shut down some shooting hordes that would normally be quite dangerous to the units of the Trident Realms army. Trident King - another very versatile and flexible hero whom I faced before. He can be even more dangerous if paired with the Kraken as they can charge frontally against any of my unit and inflict enough damage to rout them. 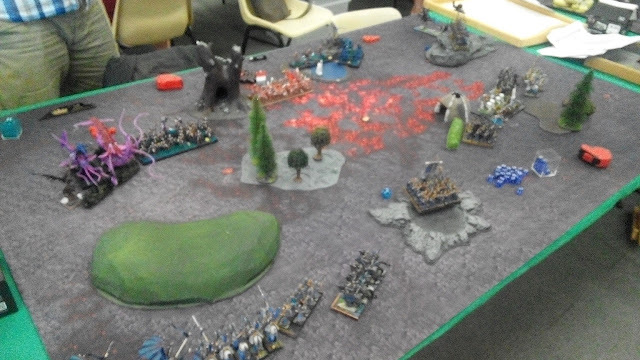 The general impression I had was that this time I faced the army that wanted to play patiently, using a bit of ranged attacks to soften the enemy. It was also set up to test a few new upgrades that were given to the army list, with Placoderms being the main beneficiary. As the army had fewer elements, I wanted to try and divide the units so that I could use higher speed and maneuverability to set up the combined charges that worked well last time. 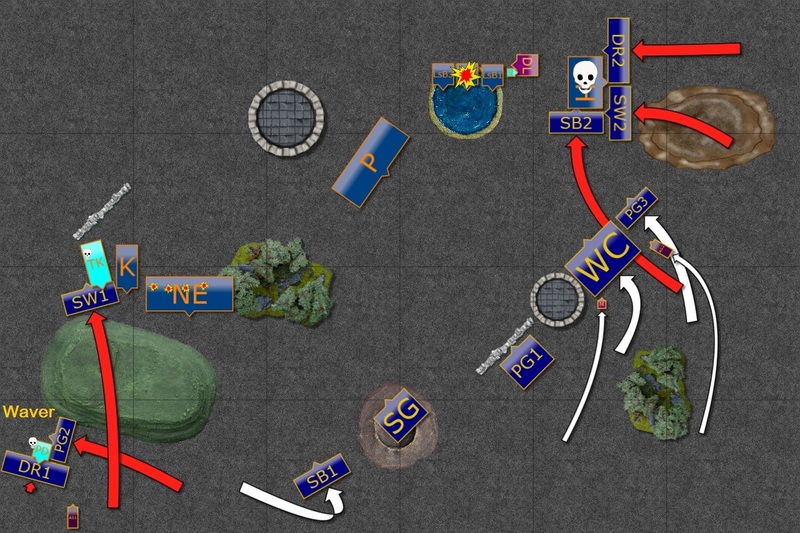 We played Dominate scenario so I had to come up with the plan to keep enough units to be able to hold in the center while at the same time preventing the enemy from doing the same. But at the same time my army does not have the staying power to just march to the middle and fortify there. 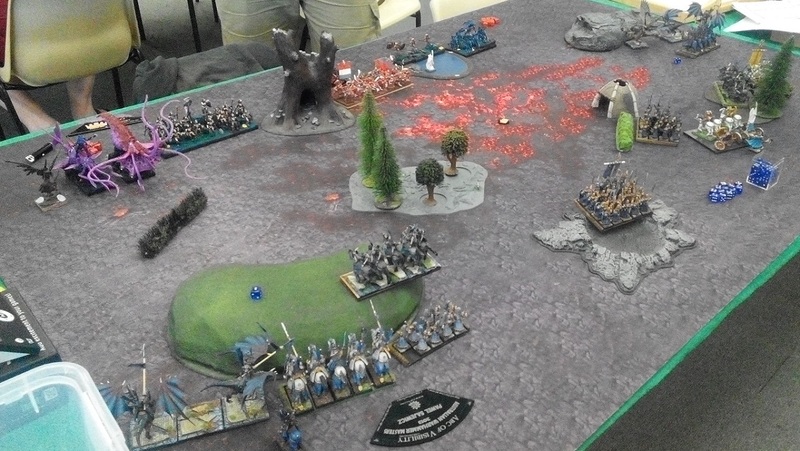 Instead, I decided to form two groups that would attempt to outflank the enemy so that I had better chances in eliminating the unit of the Trident Realms. In doing so I hoped to achieve two things. First, remove these units from the center of the battle field and second, get mine in good position. 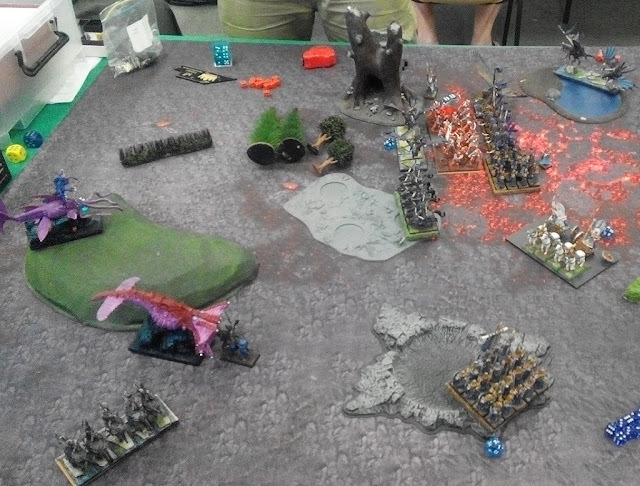 In addition, flank attacks was what I needed anyway to be able to rout these big hordes. 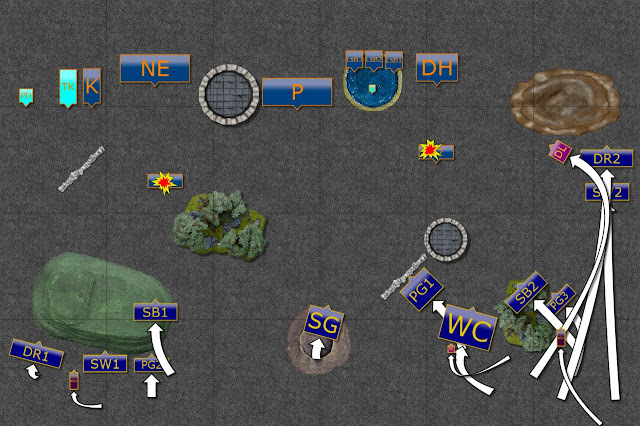 I wanted to use the right flank to move the fliers fast and engage the Banes quick. With mutual support and a bit of terrain, I hoped to get a bit of protection against the shooting. At the same time I revised the plan for the group on the left. 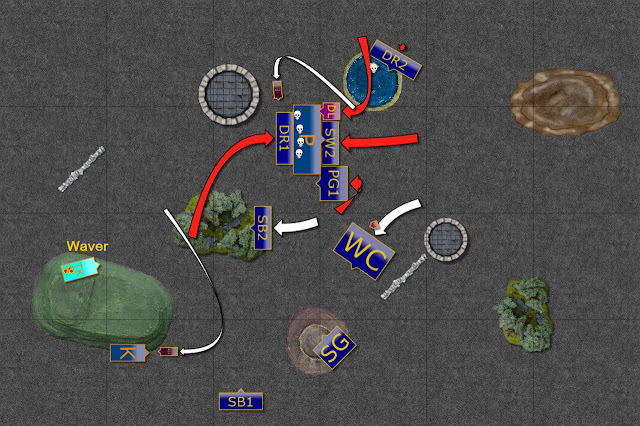 It was clear I could not go there for melee because my own units could have been intercepted by the flying hero and in the war of attrition the enemy had upper hand. The new plan was to tie them up there so that they would not turn towards the center. The only unit in the center was Sea Guard as I wanted them to stay close and simply keep shooting at what needs to be targeted at particular time. If they survived long enough they could still move forward into the middle of the battle field. I got first turn again! 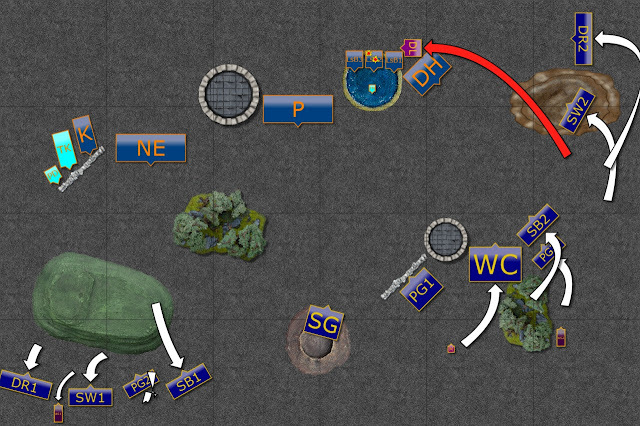 The Elves advanced over the entire battle line but it was on the right where the maneuvering was the most aggressive. 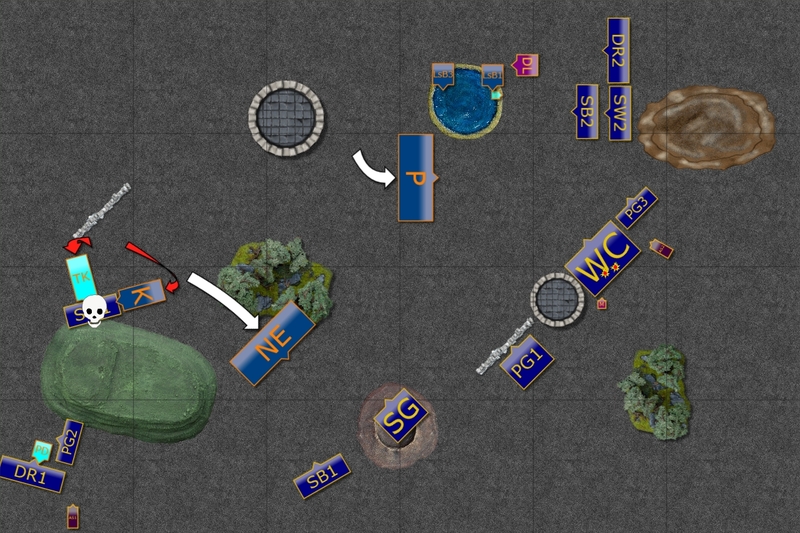 Drakon Riders, led by their Lord, moved quickly to the flank where they could avoid the deadly war engines and start outmaneuvering slower enemies. 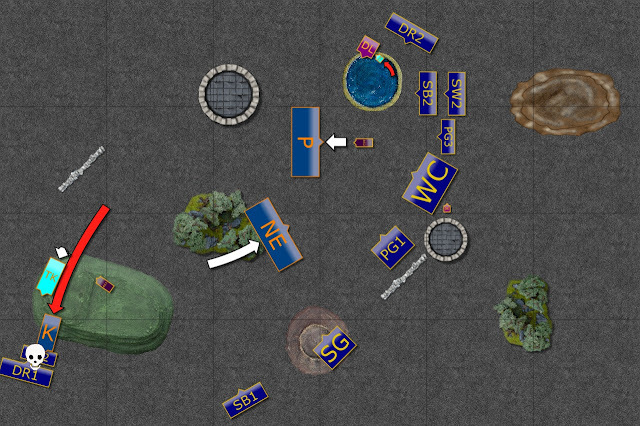 At the same time, the shooters aimed at the exposed Noken and all got lucky enough to rout both units before they reached good, defensive positions. Trident Realms move to meet the enemy head on. Sea Guard suffers the most! 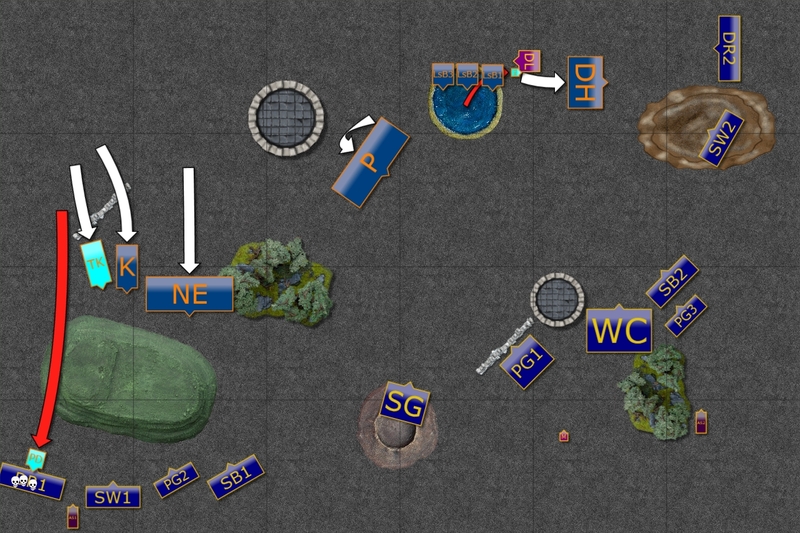 The Trident Kings points at the enemy and his units obey. He needs to move fast to roll that flank and help the center as it was clear that the Elves would soon attack there. War Engines all aimed at the Sea Guard but despite heavy casualties, Elven marines :) held their ground. 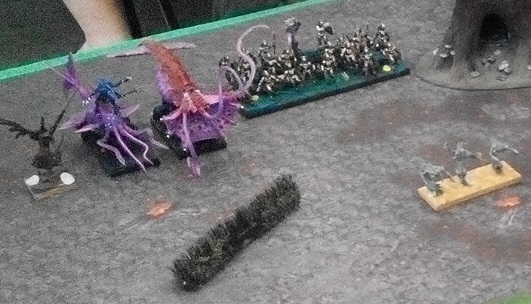 The Outcasts had to be patient and they definitely didn't want to get into melee against Trident Kings and his Kraken. Hence, the order was given and the units pulled back. However, on the opposite flank the Drakon Lord could engage the first of the war engines and while it held it would not shoot for a while. 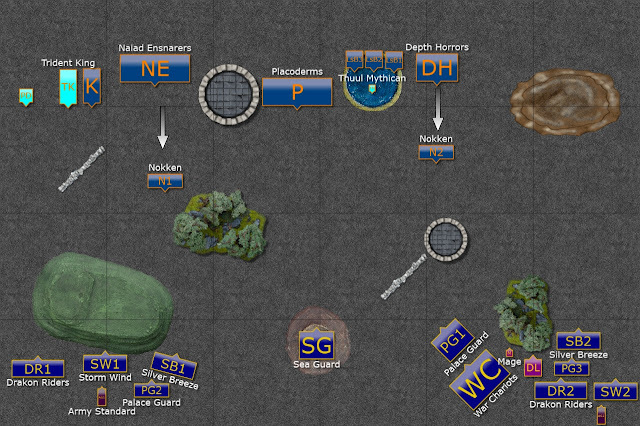 The rest of the units moved to new positions, preparing to attack the Horrors. Nereticans press on the left. As the Elves have already committed some units to the melee, the Nereticans had to respond quickly. Tull was the first to spearhead the attack and Drakon Riders were the target. They held but were grounded for now. 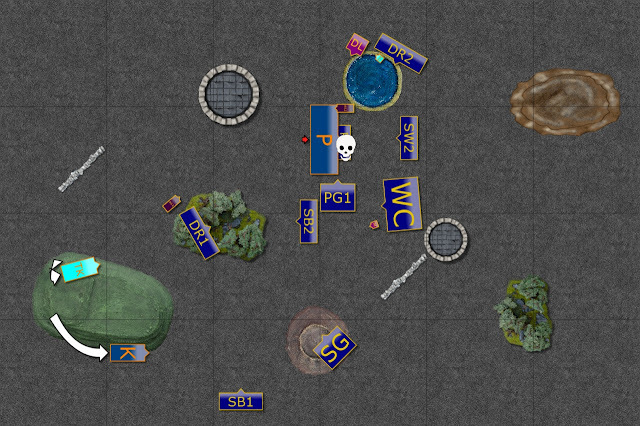 More units are engaged in deadly melee. The armies escalated the combats on both flanks. First, the cavalry units on the right flank surrounded the Horrors from two directions and that unit was routed on the charge. The War Chariots also contributed to the success on that flank by destroying damaged Leviathan's Bane. One down, two to go! 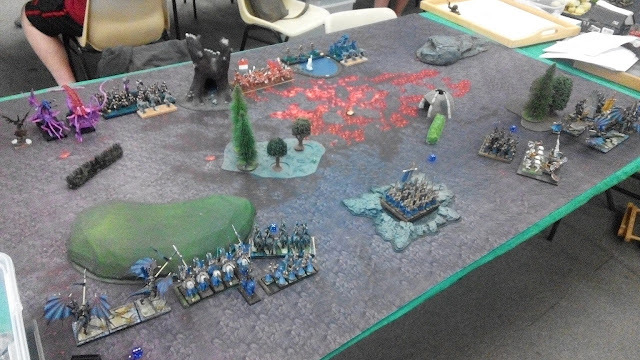 On the left flank the situation was more difficult for the Elves so they had to make some sacrifices. 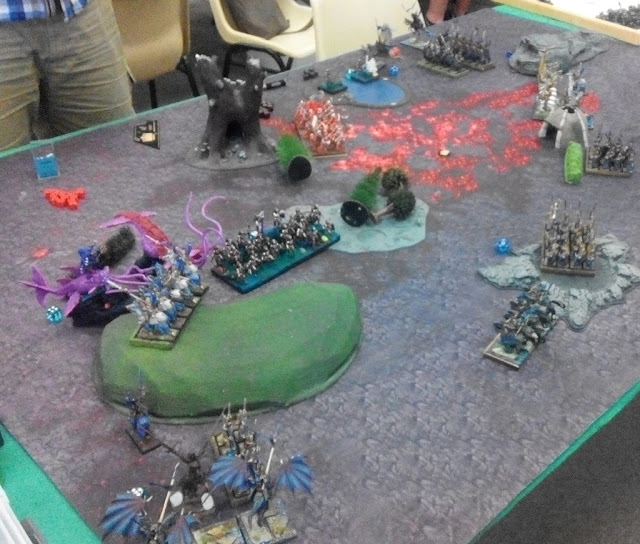 First, the Storm Wind cavalry attacked the King but in doing so, also blocked the Kraken from moving around. It bought some time for the Drakon Riders and the Palace Guard to attack Tuul who got wavered in the process. Naiads use the forest as a cover for the advance. 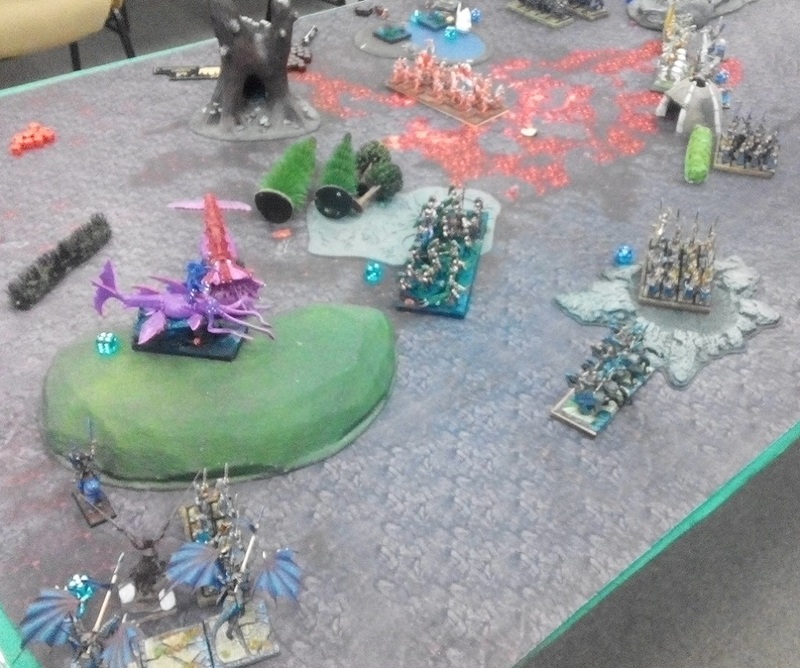 The King and Kraken had no problem in routing small unit of Elven Knights but that meant they were also slowed down in their advance. 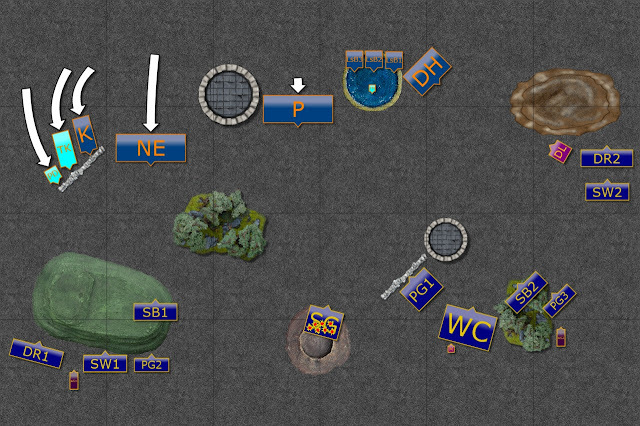 Naiads tried to make up for it and used nearby forest to cover their advance towards the Sea Guard. The Elves surround the right flank. As the battle continues, there were new developments on each front. 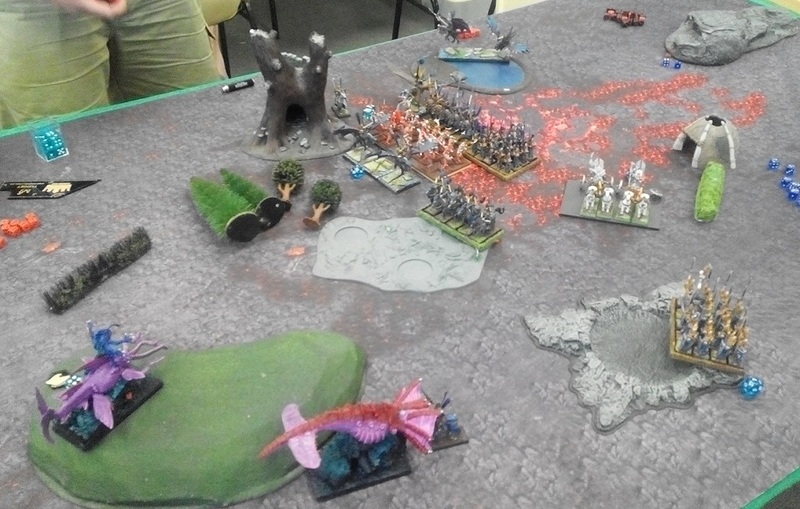 Thanks to the sacrifice of the noble Knights, Drakon Riders and Palace Guard finished off Thuul and prepared to receive the charge from the Kraken. At the same time their companions did well against war engines and destroyed them all while the majority of the Elven army moved to positions to engage the Placoderms. The Kraken was released and the Palace Guard could not hold the lines against such a monster! In the center, Placoderms pulled back a little to protect their flanks while nearby Naiads rushed to help. The fight to dominate the center begins. 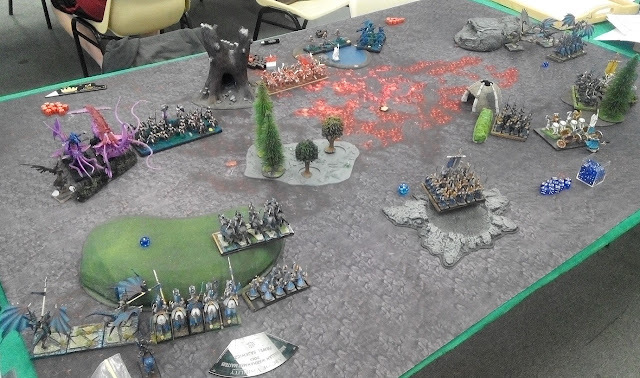 As the King and the Kraken ventured too far away from the center of the battle field, Elves decided to begin the fight to dominate that area of the battle field. First, the shooters all focused on damaged Naiad horde and managed to destroy it. 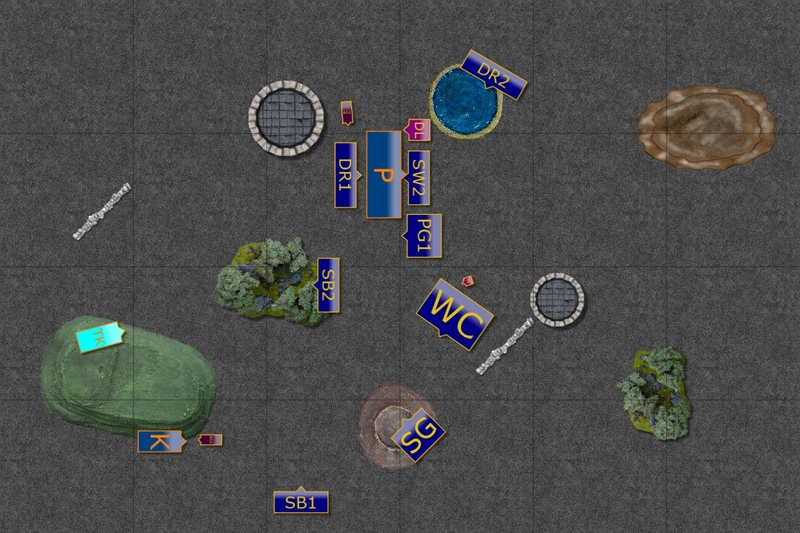 Not only that removed a big unit of the enemy from the battle but also saved many Elven warriors from falling to the explosion of the treacherous crystal. It was then up to Placoderms to defend against overwhelming Elven forces. Placoderms attacked Palace Guard and overwhelmed small unit of Elves. The horde pulled back after that and locked shields in the defensive formation in order to brace for the inevitable attack. 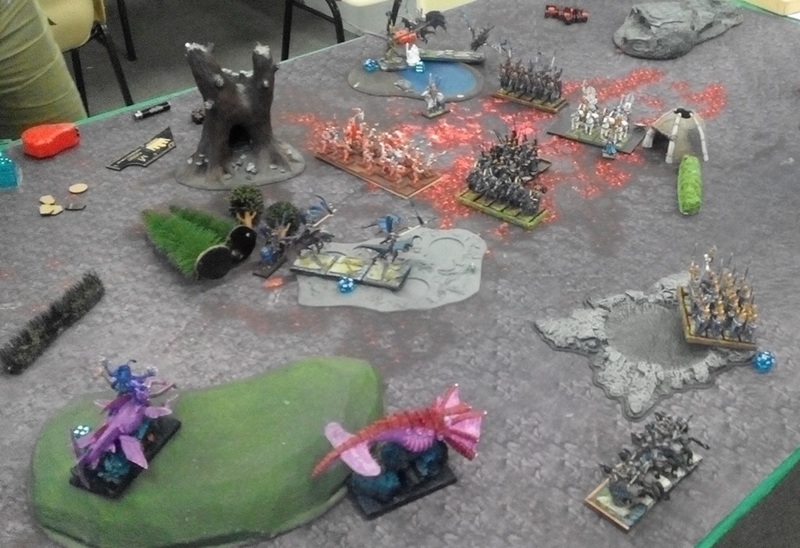 Four Elven units coordinated their efforts to attack the Placoderms. 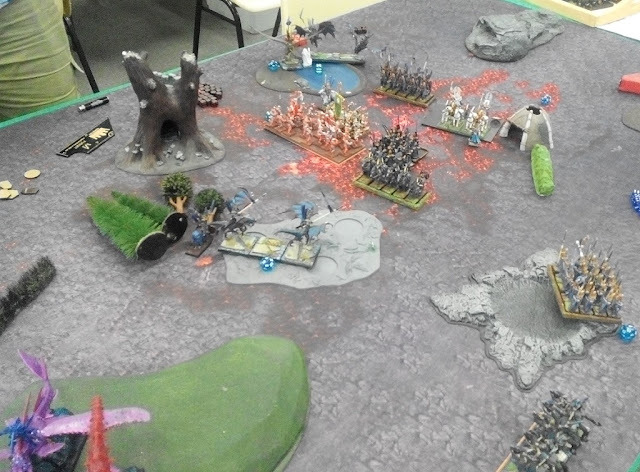 The units from the front did not hope to inflict much damage (and they did none!) but wanted to distract the enemy. That should allow the Drakon Riders to smash into rear. However, that was still not enough to bring the unit down! With only one unit left standing, the King orders a withdraw and Elves allow the free pass as they know that cornered enemy would fight twice as hard. The objective was achieved and the battle was won! I would like to thank Tas for yet another great game! It is always a great pleasure to play against you and your army looks better and better! I am sure you would agree that MVP award should go to Placoderms! In fact, that they held up and that there were no turn 7 was a very important factor for the overall standings too (spoiler alert! :)). But I really like how this turned out because it added to the dramatics of the melee and the battle was far more epic with them holding the line against all odds. 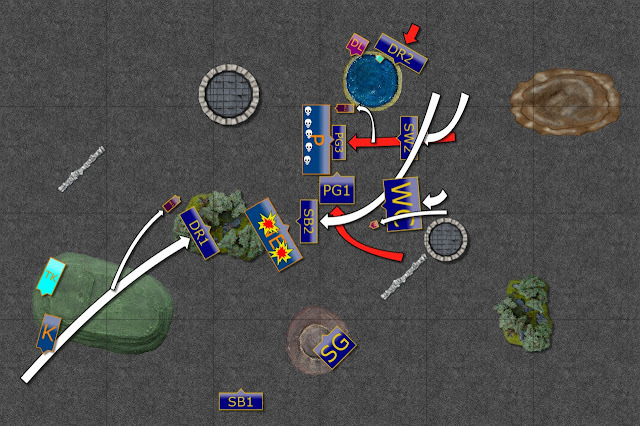 I was happy the plan worked out and that I managed to win on the right flank faster than I lost the left so that the units where in the good spot for the final rounds. In addition, I managed to rout Naiads before they blew my units which was a great success. Normally, I would not shoot at them unless I could focus all the fire but it showed that it may not be the only option. Yes, that one big shooting phase arrived eventually but I inflicted some damage before and was lucky enough it was not regenerated fast enough. I wonder how to maneuver better, though, in order to get to the flanks of the enemy units and to prevent them to either reform or pull back to avoid that. Clearly, that was what I needed against Placoderms and if only Palace Guard or even Drakon Lord where in the flank zone then I would have had a better chance to get them. Maybe I should have started with Palace Guard a bit closer to the center? In any case it was a great game against a great opponent and I was very happy that I could finish the event like that. Another great example of how strong MSU could be with the right application! Are there more pictures of Tas's army somewhere, they look incredible. As far as your question about preventing the reform from enemy units or them backing up, maybe a BSB with the wings of the honeymaze? That is only around 100 point investment, and they can hop behind the unit so they aren't able to back up or wheel. It feels a little cheap, but it may get the job done! Thanks! I am happy I could utilize speed and maneuverability of my army to a good effect! Hopefully he will get back to some updates soon! It is a very good idea and the one I have not explored yet. Blocking enemy unit from pulling back should be possible with other elements too, I may even use Army Standards as they are in that role. Thanks a lot for the valuable suggestion! Monster March! - Week 5 - The Final!